green truck vegan burgers for $1?! make it happen! wanna get the green truck’s famous mother trucker burger for just ONE DOLLAR on groundhog day?! if 1,000 people rsvp and say they want it by the end of the january, it’s game on. the mother trucker: signature vegan burger made in house and topped with heirloom tomato, sprouts or mixed greens, topped with trucker sauce. normally $7....GET IT FOR A BUCK! green truck goes ALL VEGAN! for one day. as you probably know, green truck is one of the original LA food trucks. 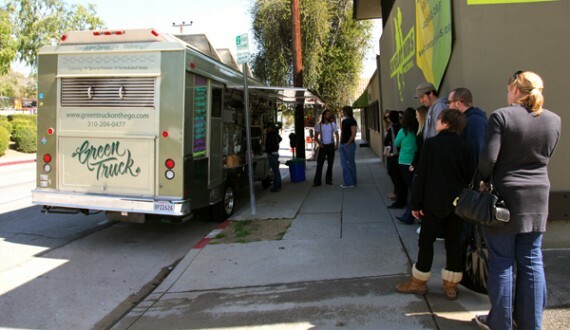 years before all these other mobile vendors arrived on the scene, green truck was tweeting and serving up healthy, organic, and vegan-friendly fare to the los angeles community. the company has a strong focus on the environment, they use produce from local farmers and even power their vehicles with vegetable oil. although the green truck has been around forever, i never had the chance to try them until yesterday. they are usually based way over on the west side, but on thursday afternoon they decided to do a special stint in silverlake near the peta office on rowena. 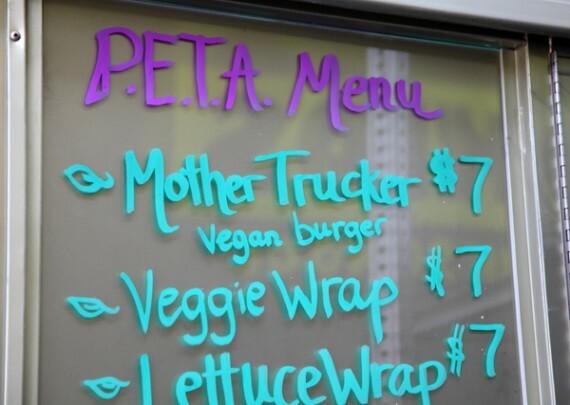 the green truck typically serves both meat and vegan options—but yesterday, aiming to please, they went all out and created an entirely animal-free menu for the event. of course i had to check it out. i had a bite of this burger, and i must say i am a fan. 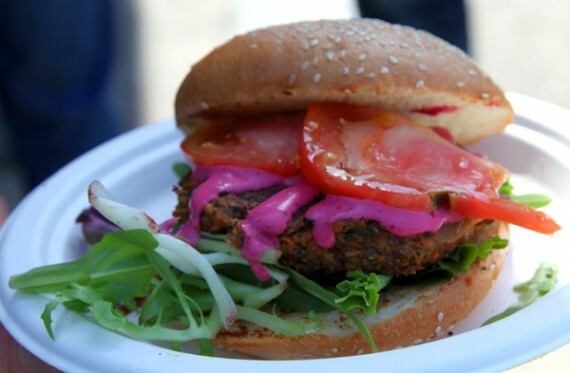 the patty is thick and full of vegetables, and the beet-based sauce they put on it is excellent. next time i am gonna have to get a whole one of these to myself so i can describe it in full detail. wanting to take advantage of the special vegan menu, i ordered the south central farm wrap, which was made with freshly-picked, local, organic produce from a farm right here in los angeles. 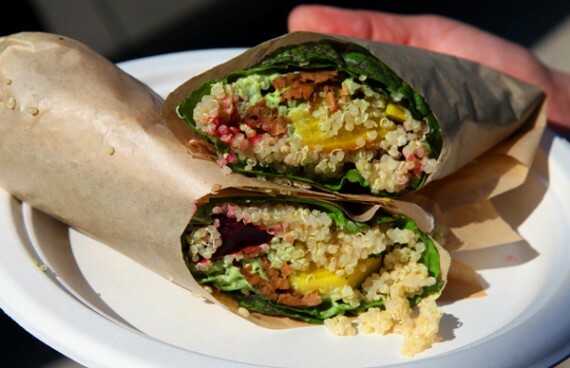 it consisted of a colorful variety of beets and tomatoes, fluffy quinoa, soft tempeh, and tahini, all wrapped up in mustard greens. i think it normally includes bell peppers (which i hate), but i made it pretty clear i didn’t want any of those. the wrap was great—light, delicious, and refreshing. my only complaint is it fell apart and got a little messy, but that’s no big deal. i covered this thing in the green truck’s homemade hot sauce, which made it even better! so don’t be like me and wait years to try the green truck. track it down next time it’s in your area and order the mother trucker. and if you ever hear about them being in silverlake near peta again, BE SURE TO GO! let’s support these guys for going 100% vegan, even if it’s only for one day. be sure to follow the green truck on twitter and check out their website for more info.